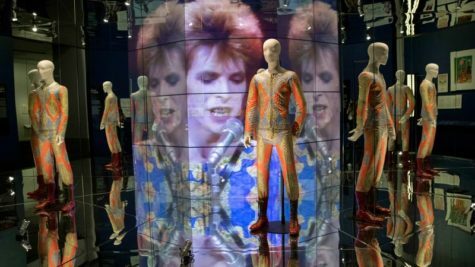 Five years after it began in London, the historic “David Bowie Is” exhibit makes its last stop at the Brooklyn Museum, where it runs to July 15th. It’s a stunning tour of Bowie’s world – whatever your level of Bowie fascination, it’s impossible to walk more than a few inches without being dazzled. It has previously unseen relics from all over his 50-year career, from his collection of designer shoes to his Seventies coke spoon, labeled bluntly, “Cocaine spoon, 1976.” As Bowie intended, the exhibit began in London and ends in New York, as his life and career did. For the man who sang “My brain hurt like a warehouse” in “Five Years,” it’s not just a collection of his artifacts – it’s a collection of all the different people he was.